Most people experience a culture shock when they come into contact with a culture that is different from their own. They need to adapt to this new culture and that is very challenging. The 5 culture shock stages are all characterized by different emotions, and feelings, and coping strategies. People may feel confused, nervous, and frustrated, but also excited and happy. 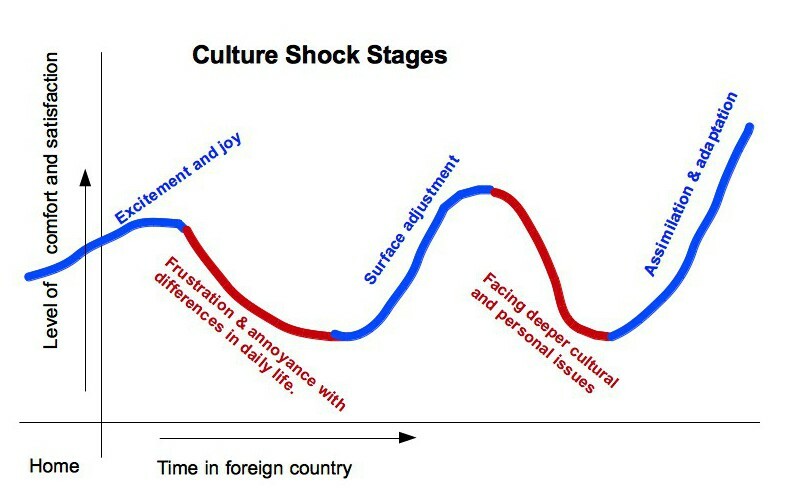 The culture shock stages are similar for the majority of people who move abroad (expats), and are only recognized after a while. Even though a culture shock may be confusing to you, and may give you the feeling as if you are in an emotional roller coaster, there are a lot of things you can do to reduce the impact of each of the culture shock stages. Consider taking the culture shock questionnaire to find out in which culture shock stage you are at the moment. At Barends Psychology Practice, guidance for people living or working abroad is offered. Contact us to schedule a first, free of charge, appointment. (Depending on your health insurance, treatment may be reimbursed). What are the symptoms of a culture shock? Note: if you recognize these symptoms, please consult a professional therapist/counselor. How can you deal with the culture shock stages? Before you move abroad it’s very important to prepare yourself well. The page: common expats problems will help you a lot, probably. Culture shock stage 1: the honeymoon stage. When you move abroad, the honeymoon stage is the first of the culture shock stages you experience. You are probably excited about the move, and are looking forward to all the new things you will experience. It’s also wonderful to be able to tell your friends and family back home about everything that is different and great. Feeling down is almost impossible with so many new experiences and impressions to process. Of all culture shock stages this is a very nice stage to be in. The honeymoon stage can last from a few days up to a few weeks. Culture shock stage 2: Rejection stage. Of all culture shock stages, the rejection stage is the most difficult to deal with. For most expats, the rejection stage begins after the first (cultural) misunderstanding with co-workers or locals. For others, the rejection stage begins when they realize they miss home. Feelings of irritability, frustration, and anger are common in this stage. These feelings begin to emerge when you have experienced some cultural differences. For example being on time for appointments. If it’s normal for you to be on time for appointments, then it can be quite annoying when others are always late. Small differences are becoming annoying and frustrating. After a while these negative feelings can lead to feelings of loneliness, homesickness, and isolation. In case you are struggling with loneliness, you may be interested in: dealing with loneliness. Although this is one of the culture shock stages that seems to last forever, usually it lasts from a few weeks up to a few months. How can I deal with this culture shock stage? Have an open mind: stop being judgemental. Being judgemental makes adjusting to the new culture more difficult. Instead, have an open mind. Stop comparing: compared with ‘home’ your ‘new’ country or city is always worse. During this stage your negative feelings automatically highlight the annoying things of the new culture. And it’s these things you are using for comparison. In other words, it’s a lose-lose situation. Comparing home with the new culture makes you feel more homesick, lonely, angry, and frustrated. Accept differences: you are in a different culture now so it’s important to accept the way the people of this new culture live, think, and behave. Try to find out why locals do things the way they do. Lower your expectations: The higher your expectations the more likely it is that your expectations will not be met. By lowering your expectations you will sooner appreciate new experiences and changes. Talk with locals: by talking with locals you find out more about the way they live. Find someone who you feel comfortable with to express your feelings and talk about your difficulties. Culture shock stage 3: Surface adjustment. By now people know their way around the city. They got used to the new lifestyle people have around them. Most people understand where their irritations and frustrations came from and they are not bothered by minor cultural differences anymore. They have created themselves a daily routine, which makes life a lot easier. During the surface adjustment stage people start to focus on the things that really matter: work, family life, sports, and hobbies. At the same time, it takes less energy to adjust to new things or changes. People seem to have settled. Unfortunately, a few things may still cause little annoyance. Most expats feel a little bit of an outsider. For them fitting in is difficult. They don’t feel completely accepted by locals. Others miss that click with people like they have with friends back home. And for some expats it remains difficult to deal with a few cultural differences. This is one of the most confusing of the culture shock stages because people feel better than before but they’re not quite there yet. Accept the fact that you’re still adjusting: although you feel much better than before you are still adjusting to your new life. And with adjustment comes frustration and annoyance. It takes time and effort to adjust. Don’t try too hard: people who try too hard to fit in usually behave unlike themselves. This will backfire sooner or later. Just go with the flow and observe how you are adjusting. Lower your expectations: it’s difficult to meet high expectations. It took you years to find the friends you had back home, so don’t expect to find their replacements within a few months. It’s better to have a few more friends with whom you click on different levels than to keep searching for those 2 good friends who have it all. Culture shock stage 4: Deeper adjustment. People are focussing on work and family life now. They have settled. And now that they have settled they automatically pay attention to the differences in culture, lifestyle, and social interaction. Perhaps they’ve come to realize that it’s more difficult for them to accept certain differences. Think of the way people talk to others, the questions they (don’t) ask, the physical distance between two individuals when they talk. Or perhaps the directness, rudeness, or politeness of people, their behaviour in stores, on the road, and so on. This is one of the culture shock stages where expats are bothered the most by cultural differences when they are irritated or frustrated. The fact that people can’t behave the way they are used to when they are upset, frustrated, or annoyed makes those differences even more difficult to deal with. People try as much as they can but it takes a lot of energy. Ventilate! : The longer you keep your frustrations in the bigger the inevitable explosion will be. Unfortunately, the timing of such an explosion is very, very bad. It’s important to ventilate your frustration. Let it out. Talk to your friends, or family, or turn to an online group where you can ventilate. Others like to get rid of their frustration by focussing more on sports or games. Perfect! Find out more about the new culture: understanding situations, behaviour, and expectations makes it easier to accept differences. Read more about the differences or simply talk about it with a local person you trust. They will be very happy to explain their culture to you. Accept that ‘they’ will not change: you are visiting their culture and you are on their territory. So don’t expect them to change for you. If the Dutch people are rude/direct, the French arrogant, the Americans fake, the British too polite (and so on) then you know what to expect. This is one of the culture shock stages where you realize that they won’t change. It’s all up to you. Analyse your own culture. : Is your culture that great? Is everything perfect? Or are there things you dislike? Every culture has its good and bad points. It’s not a crime to analyse your own culture and to borrow a few things from a foreign culture. Culture shock stage 5: Adjustment. Finally, you‘ve reached the last one of the culture shock stages. By now you can accept the differences. You’ve borrowed some behaviours, rituals, or habits from a foreign culture and you can have a good laugh about a few silly ones of your own. You feel more accepted and you even notice that you are starting to find certain things back home strange/disgusting/unpolite (and so on). It’s important to realize that you slowly change. Your sense of self is reevaluated and you can now hoover above your own culture, rituals and habits and see them from someone else’s perspective. This is one of the culture shock stages where you feel a little distance between you and your own culture. Not a big one, but it’s noticable. 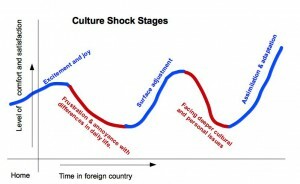 If you have trouble dealing with one of these culture shock stages then don’t hesitate, but find yourself a counselor/therapist who can guide you through this process. Make sure this is a therapist who understands the situation.